I have been working with the principal, Charlie McDaniel, of the new East Ridge Middle School (ERMS) in Lake County, FL. The administrative and guidance leadership of the school worked to create an advisory program for the 6th,7th,and8th grades students coming to this brand new school. Students will stay in the same advisory group through their three years but will have a different advisory teacher at each grade. These teachers will form an advisory unit working together during the three years focusing on each student’s needs. One guidance counselor will stay with the students through their three years. I was asked to create a workshop to assist teachers in their advising role and to explore advisors’ communications with parents as the school year started. I decided to focus on open ended questions and paraphrases as verbal skills that used consciously would increase teachers “knowing” their students. I defined opened ended questions as those where the answer to the question drives the direction of the conversation and closed questions as those were the question controls the direction of the conversations. We identified purposes for open and closed question in classrooms. This activity pointed that the purpose of the advisories would often require an open environment. Teachers then practiced forming open questions identifying students’ past school experiences and future plans, and questions for initial calls to parents. • Describe a project you did last year that you spent a lot of effort on….Why did you put in effort? • What would you look for when picking a future job? Why? • What was your impression after our orientation program? • As your daughter’s advisor, what do you think is important for me know? •What are your expectations of a middle school program? •If you were selecting teachers for your son, what would you look for in the teacher? Why? Student: I put a lot of effort into an English project where my best friend and I wrote a story and illustrated it as a book for 1st graders. We got to read it to the kids and they really liked it. * You enjoyed working hard with your friend. * Sounds like you are skilled in writing. * When the kids enjoyed it, the hard work was worth it. Parent: I’d pick a stern, caring teacher for my son. He can talk his way out of work if you let him. • Your son has the gift of gab. • Sounds like you have a charmer. • You want the sternness to come from caring. Several days after this workshop for middle school teachers, I was in Gainesville, FL (Alachua County Schools) facilitating a session with coaches and mentors for beginning teachers. I was asked for suggestions on how to hold the initial conversation of introduction with beginning teachers. I pulled up the above examples from the advisor workshop to practice open questions and paraphrases. 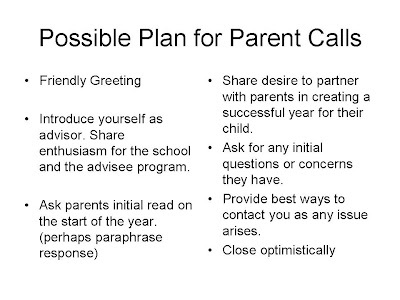 Then we discovered that with a little tweaking the plan for parent calls could be transformed into initial conversations with beginning teachers. Take a moment and try it!